Arts Home > Events > 2018 > October > A Woman's Place? Tue., Oct. 16, 2018 11:00 a.m.
9/11 fundamentally transformed how the U.S. approached counterterrorism and led to the unprecedented evolution and expansion of full-spectrum U.S. counterterrorism strategies, policies and practices. The diverse actors contributing to counterterrorism are increasingly considering, engaging and impacting women in their efforts, yet, flawed assumptions and stereotypes remain prevalent about their involvement as both agents and targets of these measures. 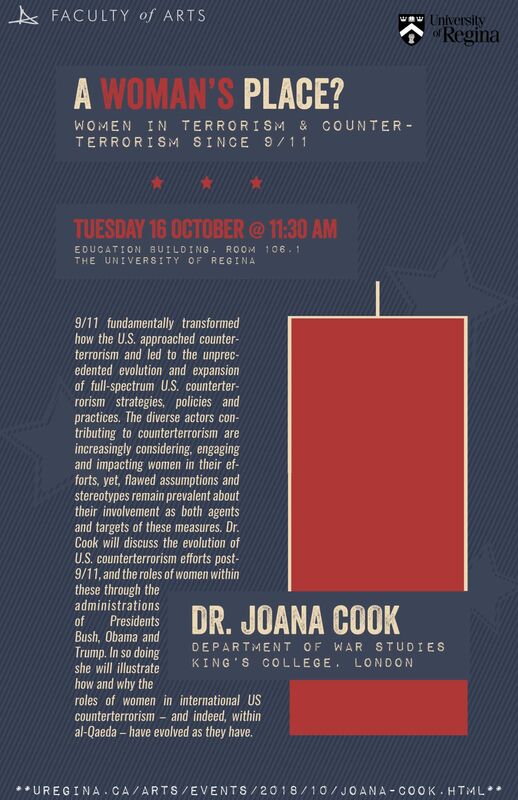 Dr. Cook will discuss the evolution of U.S. counterterrorism efforts post- 9/11, and the roles of women within these through the administrations of Presidents Bush, Obama and Trump. In so doing she will illustrate how and why the roles of women in international US counterterrorism – and indeed, within al-Qaeda – have evolved as they have. Joana Cook (BA Hons, 2010) is a 2018 University of Regina Alumni Crowning Achievement recipient. She is currently a senior research fellow with the International Centre for the STudy of Radicalism and Political Violence and a Research Affiliate with the Canadian Network for Research on Terrorism, Security and Society. Read more about Dr. Cook's work.